B&M Lifestyle | WINNER ANNOUNCEMENT - A Year's Supply of Ariel 3-in-1 Tabs for FOUR Lucky Winners! WINNER ANNOUNCEMENT - A Year's Supply of Ariel 3-in-1 Tabs for FOUR Lucky Winners! 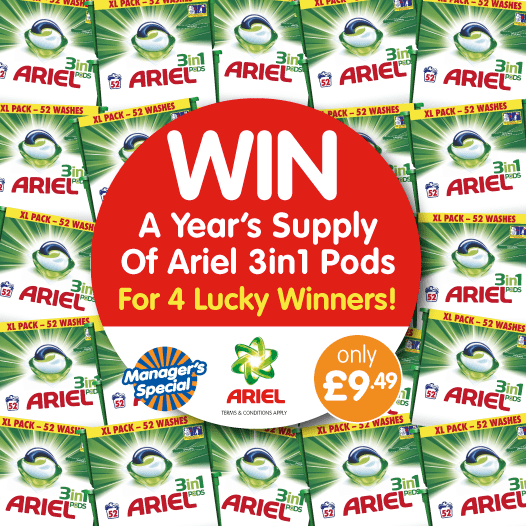 Our fantastic competition to give FOUR lucky winners a brilliant year's supply of Ariel 3-in-1 pods has now finished! The lucky winners have now been picked at random from the thousands of you who entered! Congratulations! We hope you enjoy your pods!